In Portal, players control a test participant in the Aperture Science Enrichment Center. 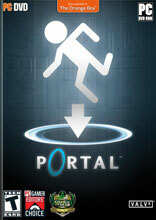 Using the "Aperture Science Handheld Portal Device", players perform a variety of tests, such as creating portals to knock over turrets and other objects or moving to a previously unreachable area. Guided by an electronic female voice that is at once both comical and subtly threatening, players must either complete these objectives or fail the test. Failure or refusal of a test likely results in death, although it may not be permanent.